Designed by our team of educators and teachers, BABELZONE is a fun and interactive language website used by many schools and home learners in the UK and abroad. Le Club Français and El Club Español have integrated BABELZONE into their French and Spanish language sessions. We pride ourselves in addressing the needs of teachers and learners alike. BABELZONE is packed with hundreds of stories, animated songs, games and printable activities organised in clear and practical units. Our aim is to make your learning or your teaching an enjoyable experience. I use your Primary level resources a lot for my younger students and they’re amazing! We use Babelzone on a daily basis throughout school from Reception to Year 6. We are delighted with the quality of the resources and the variety of activities, songs, stories and printables. The music soundtracks and recordings of native speakers are great and the site is very easy to navigate.The children have really enjoyed the stories, particularly Un Pollito! and La Jungla Cruel. Babelzone has come to play a major part in our Spanish teaching and we encourage our children to use the site at home too. Q1: I can't login - Login failed. A: The most common problem if you are a school is that the local firewall is blocking access and needs to be whitelisted. Q2: I need help to use my PROMO CODE! A: Click HERE to view a pdf file explaining how to use your PROMO CODE whether you want to register one or several users. Q3: My child attends Le Club Francais / El Club Espanol, do we still need to pay a subscription to access Babelzone? A: No! Babelzone is free to Club members. your local organiser will provide you with a 'promo code'. Q4: I log in but I dont't see the language selection page. A: Probably an installed firewall is stopping access. You need to adjust your firewall settings. Q5: When I subscribe to Babelzone, can I access activities in several languages? A: YES. Babelzone content exists in 2 languages: French and Spanish. When you subscribe, you gain access to both. Q6: To which young learners does Babelzone appeal? A: Babelzone appeals to a wide range of young learners. Typically, our units are organised around the new QCA scheme of work for KS2 beginners, but many activities can be used at KS1 level. Younger children at Foundation level react very well to some of the stories ... and of course to the songs. Q7: Is Babelzone compatible with all interactive whiteboards? A: YES. All Babelzone online activities are designed to be viewed on all types of Whiteboards and Tablets/mobile devices. Note that the printable activities are in "PDF format" and can be displayed on all whiteboards providing additional resources for imaginative teachers. Q8: Can I use Babelzone without purchasing LCF Clubs materials? A: YES. 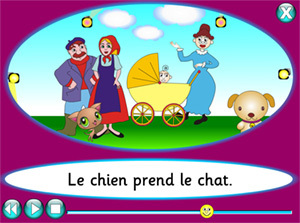 Babelzone stories, songs and games can be used without the support of our courses and materials. However, our courses include most of the stories / songs and offer you an additional wealth of audio and visual resources as well as advice and step-by-step guidance when exploring topics. Q9: I am a non-specialist teacher, will I be able to use Babelzone? A: YES! Babelzone caters for the needs of specialists and non-specialists alike. You even get downloadable soundbites in "mp3 format" and transcripts to help the non-specialists with pronunciation. Q10: The animations open in small windows. How can I fix that? A: Open Internet Explorer, then using one of the corners shrink the Windows to a smaller size (Trust us!). Open it again, this time it should open in it's last state, the smaller size. Now expand the Window using the corner again but do not use the maximizer button. Again, close IE and relaunch it. It now should take up the full screen without being 'maximized'. Now right click a link and select to 'Open in New Window'. Hopefully that link should now be a large window. Q11: How much does an ACCESS LICENCE cost? - students/teachers may use login at home outside of these times. Please email us at dispatch@lcfclubs.com for more details.